You are not allowed to remove my signature written inside the footer section of the theme. You are not allowed to sell, resell, or gain any form of money or incentives from using my work. You are not allowed to claim my work as yours. Terms stated above may be changed without prior notice. 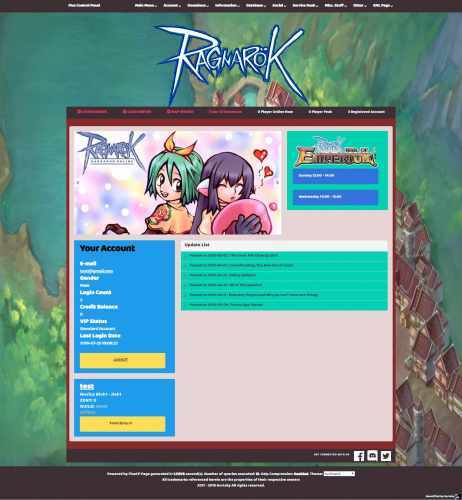 The screenshot is not really look like it, please visit the demo site for more clear picture. 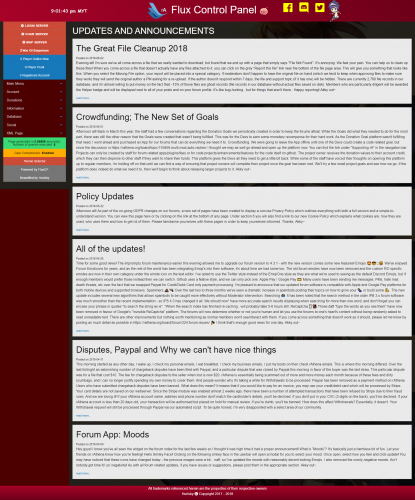 These themes are old, so I've given them a quick dusting off and updated them to work with the current theme system. You should note that the status bar at the top do not work. Neither does the WoE banner box on the homepage. There are plenty of scripts around the forums to make these both work and is a good challenge for anyone who is looking into theme development. This is an incredibly basic modification of the default bootstrap theme. Navigation moved to inside container Clouds in body background tag The changes in this theme should help other users to create their own themes. If you want to actually use it as a theme for your FluxCP installation, I'm not going to stop you, but I do recommend you continue to make changes per your needs. I'm making new Design for Fluxcp and Full Coded Theme. Simple mobile responsive FluxCP theme. Header/Logo PSD Fonts PSDs for two homepage images Theme files for use with up-to-date FluxCP 6 Loading Screens using same background This theme is capable of using new ReCaptcha code. 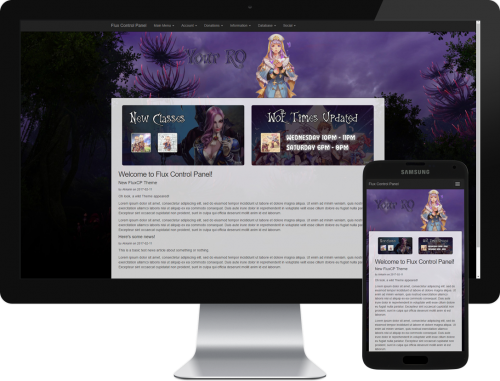 This theme is designed with ease of customisation in mind. Simply swap out the background image for a totally different feel to your site. 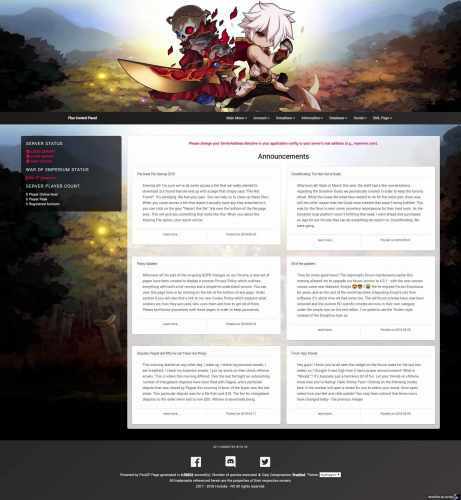 This theme has been uploaded to rAthena under the @Files user and is available for a very low price. 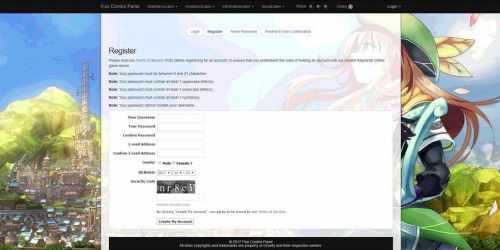 Sales generated under this user is kept by rAthena and not commission based. iRO's site thrown into theme files for rA's FluxCP. This is a reasonably complete port. All pages should now work with the theme and overflow with a scrollbar if the page data exceeds the fixed width. Note: The slideshow code on the right nav bar and the kafra shop items box on the homepage have little/no code. You are encouraged to add the code to display images yourself. You can leave it as is, or modify the design to your liking. I apologize for my laziness =) I find it easier to make a design in Photoshop than to install it in detail. This is a simple theme created by me very long time ago. 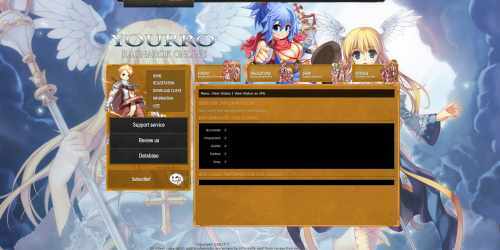 It is compatible with FluxCP running on rAthena emulator. How to install? Just replace the files with themes folder of your FluxCP and enjoy! Please leave the credits if you are using the theme. Drop me an email on [email protected] for installation support. Enjoy! 10) then click again the PSD go to ( Layers again ) Find the Logo then change it then Merge the logo then copy then paste it on the bg.jpg then place the logo where you want done. 1) Download FluxCP from Xantara and Install it. 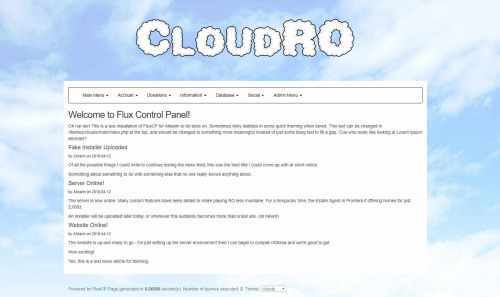 2) Download Flux CMS from CalciumKId and Install it. 3) Download Vote For Point from JayPee and Install it. If there are any errors, please don't hesitate to ask for support! Don't forget to share and like our Facebook Page! I think i used CalciumKids Flux CP here. 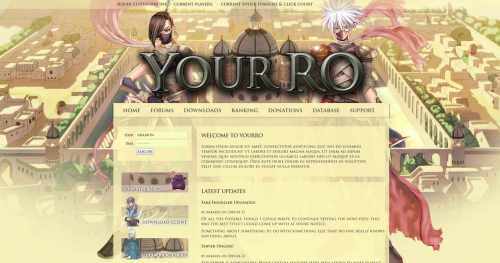 This is my old premade site that costs around 40 - 50$ (seasonal / promos). I'm now releasing it for FREE since it's old and so that i can help other developers to start on their own customization of Flux CP Hope you enjoy it and Good luck! Thanks for all the people who support our website development services. Hope i can release more in the future. Drawmove is offering to the community a Free Flux CP design with an animated char on it. We kept it simple as it is free. - Black theme.... Because Black is Elegant ! If you like this theme, please vote up! If you encounter any issue, please post in that topic, i'll answer you quickly. A very colorful and yet eye friendly website. This is a free release of my design. Its a green colored fluxcp theme, its coded with rAthena compatible fluxcp. PSD file, font files are available inside the files. 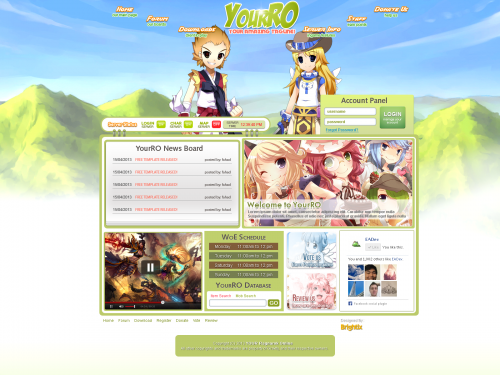 It also consist of PVP ladder script with dota announcement by ~AnnieRuru~ for the PvP Ladder on the website. 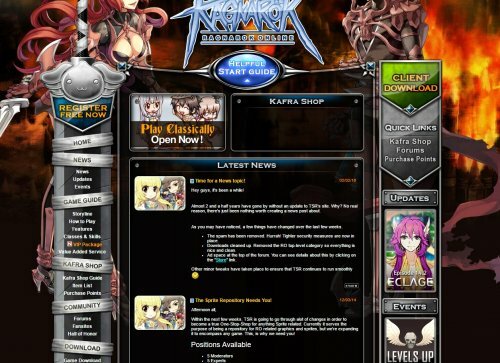 The News and Update section uses RSS feed from your forums. Easy to edit stuffs, just find eAdevconfig.php under themes/default/main/. Please leave the credits to me and eAdev. Enjoy! With Animated Golden Shura ! 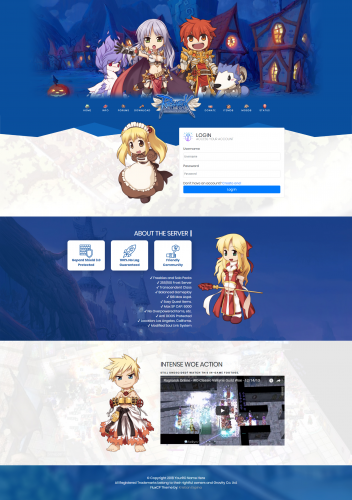 So basically its from the Free Radical RO Website and i just recoded and redesigned it. i even add some animation to it. JUST ADD YOUR OWN BANNER ETC. Step #1 : Upload the file into your "public_html/themes". Step #2 : Extract the "yolo.zip file". Step #3 : Go to "config" folder. Step #4 : Right click "Application.php" Hit "Edit"
Step #5 : Change the " ' ThemeName ' => " to " yolo " then you're all set. go to your website and hit the refresh button. For those who want a clean and simple theme made not only look and behave great in the latest desktop browsers (as well as IE7! ), but in tablet and smartphone browsers. - Extract FluxCPthemes_GlightV1.0_byGerome.rar to your "<flux_cp>" Folder. - Find This Line of Code..
- Replace "default" to "Glight" which is the name of our Themes. - Extract FluxCPthemes_Designno3_byGerome.rar to your "<flux_cp>" Folder. - Replace "default" to "designno3" which is the name of our Themes. 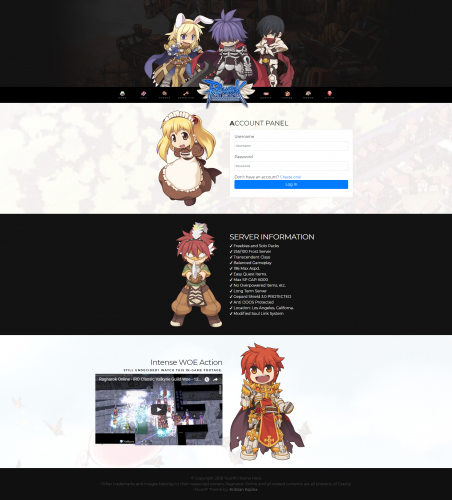 - Open gtheme/config.php and edit some necessary info. - if you have addons installed.. got to "<fuxcp directory>/addons/<Name of addons>/theme/" rename "default" to "designno3".